1. Solar Power Bank – this versatile tool not only helps juice up your phone and your other battery-operated accessories, but also lets you collect some electricity even when you’re away from the power grid. You could still power up a lot quicker with a wall outlet, but the solar cells make it particularly useful on hiking or camping trips. Solar power banks cost from $15 to $30 depending on the battery size and solar panel efficiency. 2. Universal Power Adapter – there are at least 15 different types of plugs and sockets around the world. Chargers and plugs that would work in America may not fit into the outlets used in China or the UK. Universal power adapters are thus the perfect travelling accessories for globe-trotting phone users. Universal Power Adapter $5 to $8. 3. Car Mount and Charger – plan to drive around a lot? Then a car mount and charger is an essential cell phone accessory that you simply must have on hand. Set up the mount, use voice commands, and you can work with your phone without using your hands. Couple this with a charger that slots into your car’s cigarette lighter receptacle, and your phone will be in a much better position within your car. Car Mount and Charger from $10 to $15. 4. Waterproof Phone Case – plan to sunbathe near the beach, go fishing in a lake, or take a jog out in the rain? A waterproof case could be just what you’re looking for. You won’t be able to use the touch screen while the phones are inside these cases, but the protective cover lets you bring your phone along with you as you go for a dip. You can pay as little as $4 for a basic Waterproof phone case but prices go all the way up to $80 if you want the toughest protection for your phone. 5. Pocket Projector – these miniature projectors are great for watching movies or playing games on a larger display no matter where you are. It’s exceptionally useful in hotel rooms, where you can close the curtains to darken the area. Pair it up with a pair of Bluetooth headphones, and you’ve got your own mini-theater wherever you go! Pocket Projector from $70. Prices vary according to native resolution and lumens. If you opt for a model with Android OS and good HD resolutions you can expect to pay as much as $200. 6. Wireless Sports Headphones – speaking of headphones, the wireless sports varieties are particularly useful cell phone accessories to have on hand. These can take a lot more abuse than regular earphones, and are especially resistant to sweat. This makes them perfect for exploring the warmer, more tropical regions of the world. $15 to $20 can get you a good pair of wireless sports headphones with decent audio quality and a good battery life. Although serious audiophiles may wish to spend two or three times this for a stronger bass and richer sound. 7. Smart Watch – smart watches are getting more affordable with each passing year. They are also getting smaller, to the point where they start looking like your regular old wristwatch. 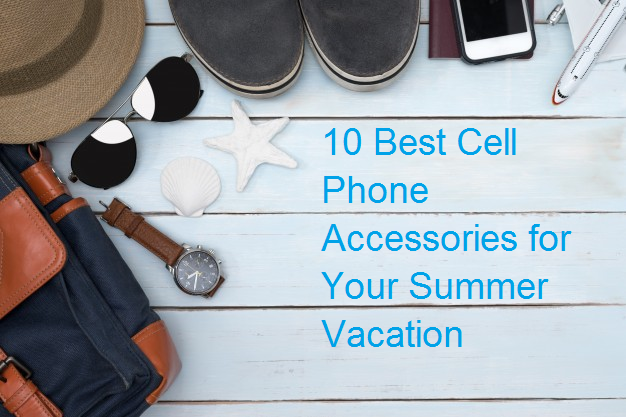 This makes them must-have cell phone accessories, especially when you want to check on your messages without having to constantly pull out your phone all the time. Smart watches are available from as little as $20. For models with and Android OS and SIM card support you should be expecting to pay $50 and above depending on features. 8. Adjustable Tripod – many of today’s phones are robust digital cameras, with high-resolution and powerful zoom capabilities. A good tripod will give you the stability you need to maximize those capabilities. It’ll give you a solid base so you can snap photos without worrying about trembling fingers or the like. Adjustable Tripods are very affordable from around $5 to $15. 9. Selfie Sticks – the much-maligned selfie stick is actually a very useful little cell phone accessory. The distance it offers lets you capture wider shots while still keeping you and the gang in the center of the image – resulting in more dramatic, more memorable snapshots. Selfie sticks are one of the most common accessory and perhaps the cheapest with prices starting from under $5. 10. Mini Camera Drone – if you want to capture some truly breath-taking images, then you’ll want the vertical reach of drones. These miniature drones are surprisingly inexpensive and easy to use, especially when paired with controllers that hook up to your phone. These phone gadgets will let you capture snapshots from vantage points you wouldn’t normally be able to reach on your own. Mini camera drones are available for around $25, but at this price range the cameras will only offer 720P video and photos at best. If you want one with all the bells and whistles such as target tracking and 4K resolutions then expect to pay closer to $200. When not blogging about tech trends, James is busy juggling a job in online marketing with taking care of his boisterous dog Charlie and launching made2b.com, a custom phone case business. Discover our discounts offer on phone camera accessories at Gojojo. Fast delivery and savings. We have an extensive collection of phone accessories for all Android smartphone and iPhone.